Aneurysms are treated in one of two ways. 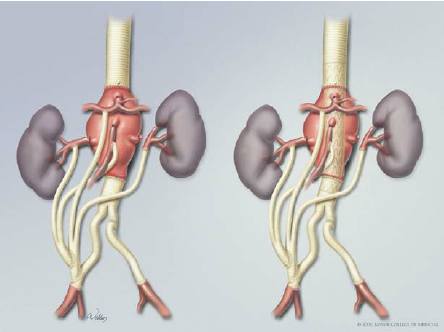 The first is the open surgical repair and the second is by, so called, endovascular repair. In complex situations both open techniques and endovascular techniques can be used on one patient to treat one or more aneurysms. Open surgery, as the name implies, requireds the patinet to be opened to perform a surgical operaton on the aneurysm. The patient is put to sleep and once the blood vessel is identified above and below the aneurysm, clamps are applied to stop the blood flowing through the diseased blood vessel. The diseased portion is then replaced with a fabric tube, sutured top and bottom to the normal artery, and the blood flow is restored again by releasing the clamps. Often after this major procedure, the patient requires some time in intensive care, and a period of recovery in hospital before going home to complete their recovery. Once the recovery has been achieved, the patient is usually cured. Open aneurysm repair is a major operation has serious risks associated with it. You vascular specialist will be best placed to identify those with you for your individual circumstances. The second main form of treatment is a newer technology. Endovascular aneurysm repair, EVAR, uses x-rays to guide the placement of fabric covered metal stents into the blood vessel, sealing above and below the diseased vessel, and so allowing the blood to pass through the diseased vessel without putting pressure on the vessel wall. The stents are inserted through small incisions in the groin, and the patients usually go home after the procedure the following day without any need of intensive care. The stents perform extremely well but there is a proportion that develop a leak at the top or bottom seal, or through one of the branches of the diseased vessel. These sometimes cause the aneurysm to continue to swell and need treatment to stop the leak. For this reason, Endovascular Aneurysm Repairs (EVAR) need regular scans so that leaks can be detected and treated early if they develop. As with all medical and surgical procedures, there are risks and potential complications and your specialist vascular surgeon will be able to inform you of those in you specific circumstances. 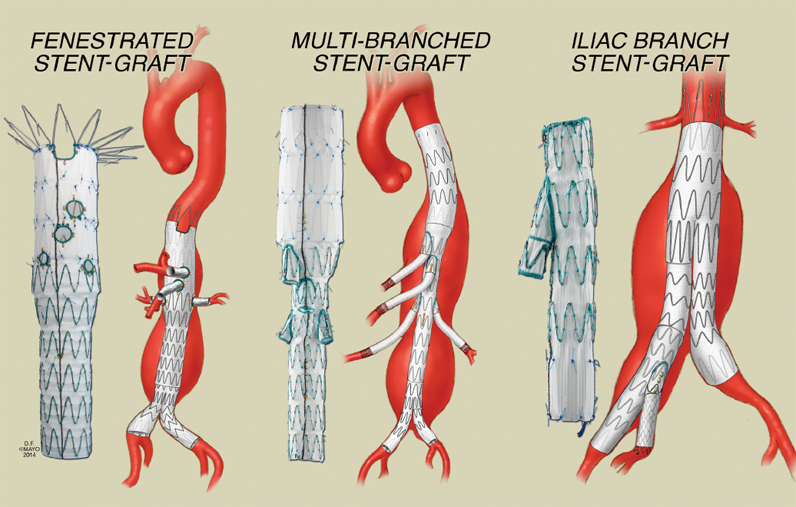 In recent times, the Endovascular technology of EVAR has developed to enable highly complex aneurysms, involving branches and parts of the aorta that were only possible to treat by high risk open surgery, to be treated safely through keyhole incisions. Christchurch Vascular Group Specialists are at the forfront of these techniques in collaboration with our Radiology collegues. There is nearly always an Endovascular solution available to aneurysmal disease. Your Specialist Vascular Surgeon will be able to guide you through the pros and cons of each treatment option in your case.